some thought before starting out. where my first spiral Christmas tree will be going. teaching us the basics of relief carving. We had a great time and will be heading back for future open carves. P.S. Put the knife to the wood and keep those chips flying. his way for all of our meetings to have the room set up and tables placed for the library. Doebert, Ron Feld, Don Lorier, Gene Mathis, Jim and Karen Rooker, Jeff See, John Schumann, and Betty Wilson. chip carvings so we can trim the tree with many styles of carving. throughout the day. Book your table today by filling out this form and giving it to Bob Lawrence. rosietom@centurytel.net. More information can be found on their website www.rockrivervalley carvers.com. should sign in at Generations to keep the money coming to them. we wish terrorism rider on our policy for the show. Members agreed we did not need the rider. seconded by Sandy Doebert. The membership approved. Sunshine Report. No report since Mary Nowacki was unable to attend the meeting. Saturday Carve. The project for the February 11 carve will be ornaments for the Meals on Wheels Christmas tree. the details for the event. available to be handed out. Don Lorier reported that Ray Henry, our wood vendor, would once again be at the show. this year is a project for younger children who can carve soap using tongue depressors. could include your request in that order. can reserve space at Lakeland University. sanding paper and was won by Joann Luke. Raffle. The diamond sharpener and magnifying glass went to Jeff See. The dockyard tool was won by Jim Rooker. from the depths of Lake Michigan, that could have been there for 100 years. past newsletters, please let me know. 4:00 pm; go to newwg.org. See flyer. 1500 Handschke Drive, New London, WI; 9 am-4 pm; go to midwisconsinchippers.weebly.com. Avenue, Oconomowoc, WI; 10 am-4 pm; contact Ray Burow 920-474-4075 or rburow1@wi.rr.com. Center, 1301 Craig Avenue, Janesville, WI; 10 am-4 pm, rosietom@centurytel.net or rockrivervalleycarvers.com. 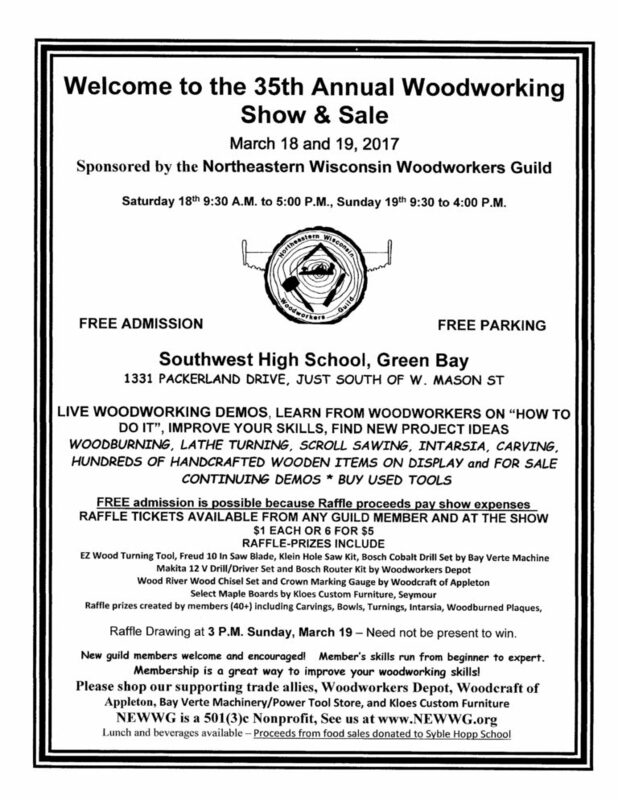 information about the show/seminars, go to wisconsinriverwoodcarvers.org. Madison, WI; 9 am - 4 pm. For more information, go to CapitalAreaCarversOfWisconsin.org or email faspich1@aol. Next meeting: March 1 at Generations in Plymouth, Wisconsin, 6:30 p.m.